I remember driving along the QEW as a child and seeing this awesome driving range close to the Skydome and hoping I could hit it up one day (pun intended). Hmm. Let me rephrase. I remember being driven along the QEW as a child and seeing this awesome driving range close to the Skydome and thinking, despite having never really played golf before, that it would be fun to take some swings in the heart of downtown surrounded by all them big buildings. Toronto’s downtown has undergone some serious changes in the last two decades, and just like all the other land down by the lakeshore, that driving range is now condos. I guess I could still go to the top of those buildings and hit some golfballs, but somehow it wouldn’t have the same effect. Or the same safety nets. Of course, downtown Toronto has basically been undergoing serious changes ever since it’s been downtown Toronto. The number of skyscrapers ripple further and further out from Toronto’s financial core, and the tallest buildings keep getting taller. There was recently a plan unveiled to build the second tallest structure in the city at Yonge & Bloor. Hiding deep within the giant bank buildings is the Commerce Court North building, a beautiful light brown building dwarved by giant shiny ones. 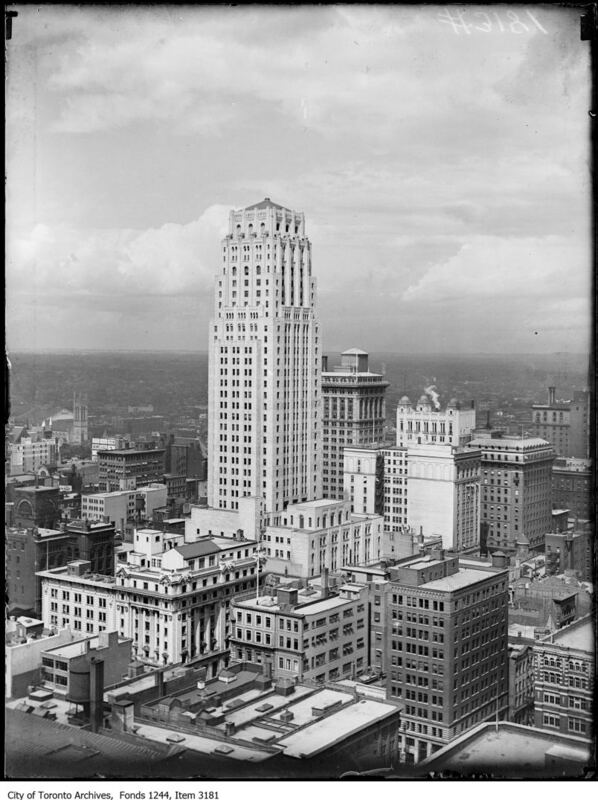 That building wasn’t always called Commerce Court North though, and it was actually the tallest building on our skyline for decades. Ladies and gents, The Canadian Bank of Commerce building. The Canadian Bank of Commerce was founded in Toronto the same year as confederation. 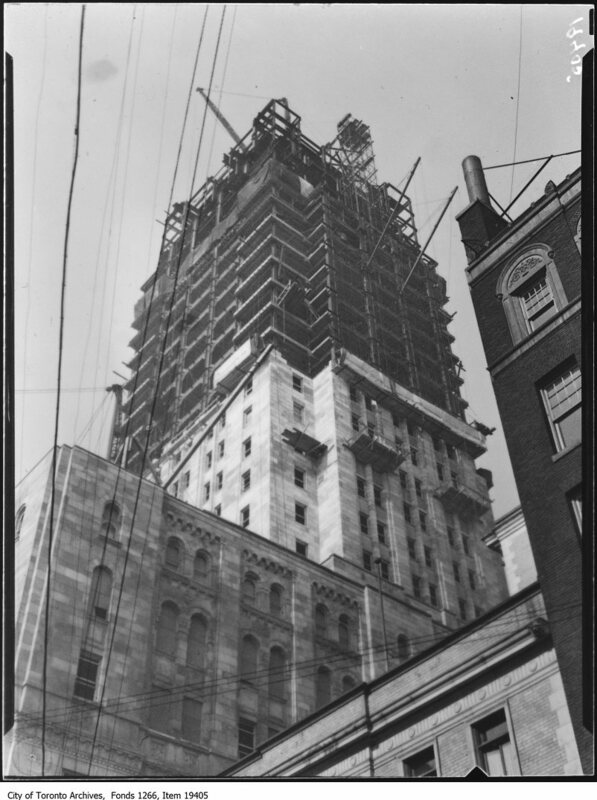 After growing steadily for a number of decades, in the early 1920s the leaders of the bank had been wanting to build a new building to either expand or replace their headquarters in downtown Toronto. They bought up adjacent land to their building and apparently were waiting for an advantageous drop in materials and labour costs in order to start their new headquarters. 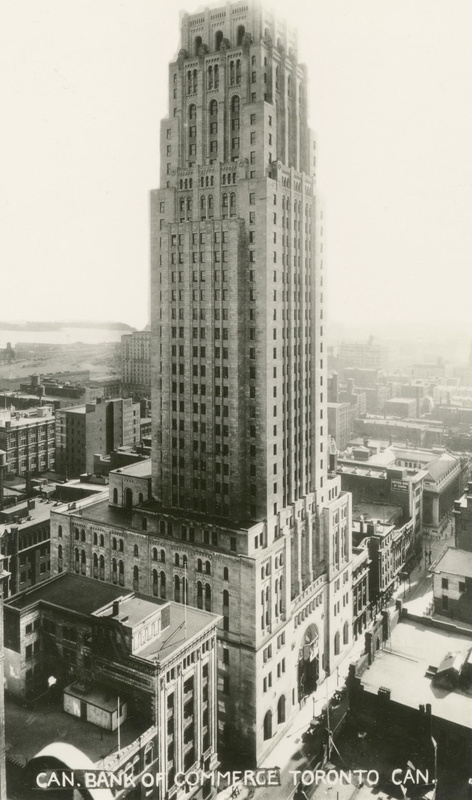 I’m not sure if that happened or they no longer had a choice, but plans for an entirely new, unprecedentedly ornate building were proposed in February of 1929. 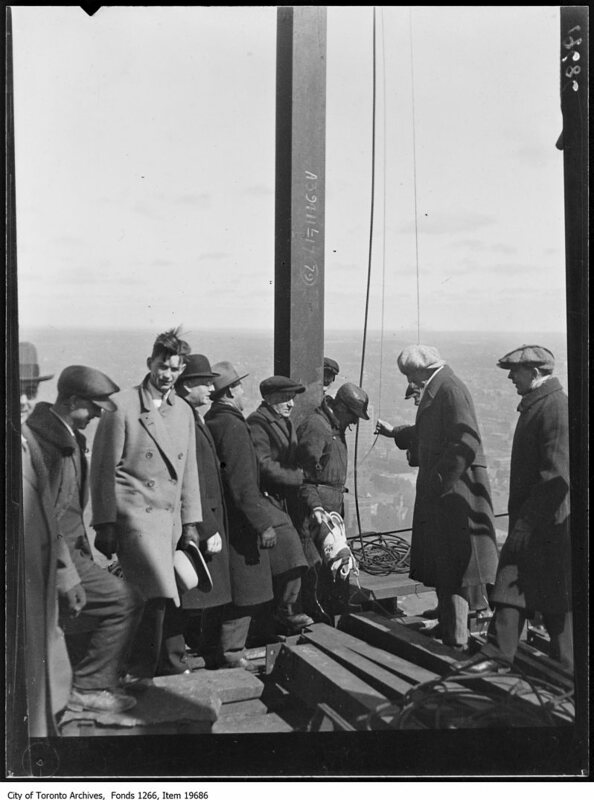 It was going to be over 30 storeys and 487 feet high, way above the 7 storey Board of Trade building or the 12 storey Forester’s Temple Building. 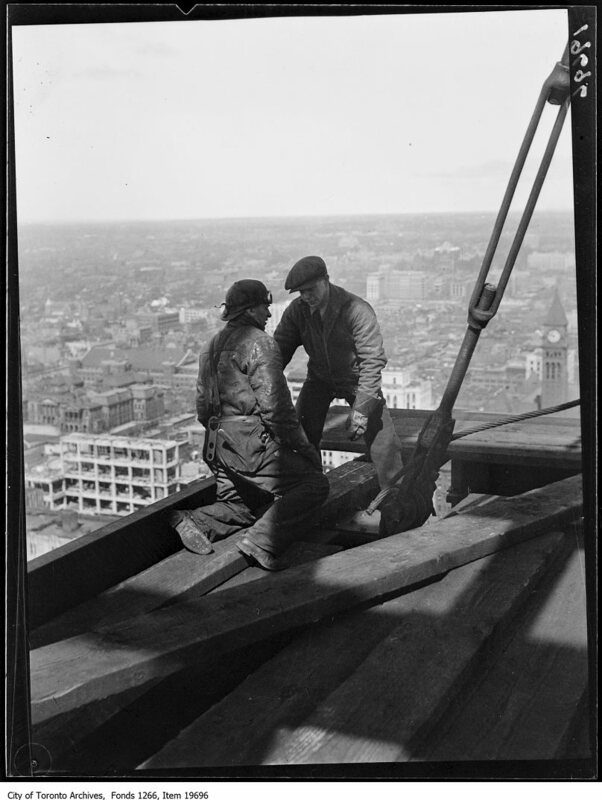 It was even going to trump the about-to-be-completed Royal York Hotel, which came in at a paltry 28 floors. 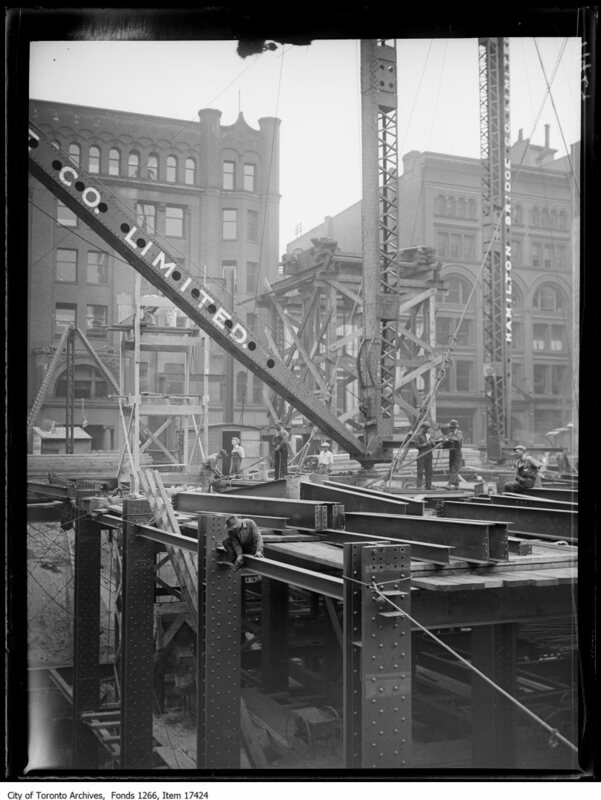 Construction started at King St & Jordan St in April 1929. It used 8,000 tons of structural steel, and later in the process, 3 thousand gallons of paint, 150 gallons of shellac, and 100 gallons of water-proofing liquid to make it the shiniest and fanciest in all the land. 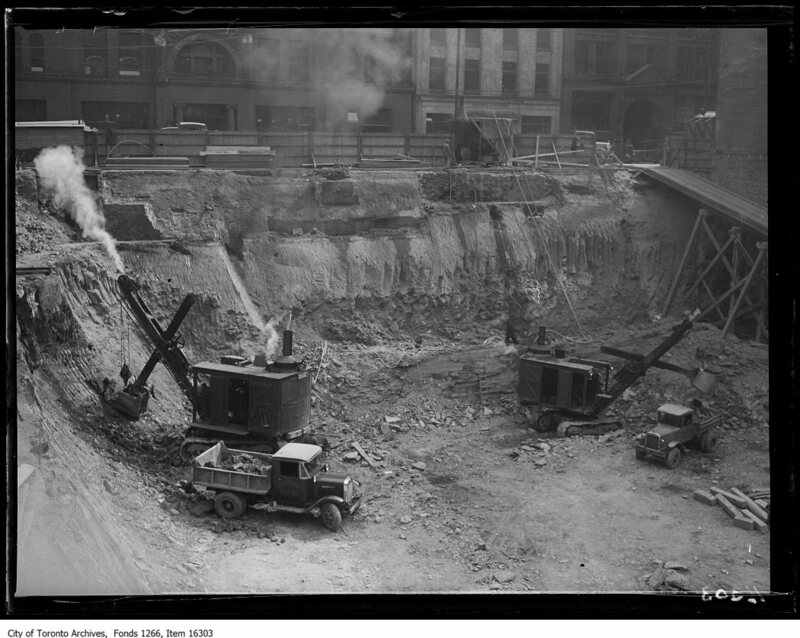 The excavation in 1929. It’s sometimes amazing to me that we so implicitly trust buildings to stay standing that were made with such old-timey equipment. Construction went on for over a year, and as the building was being finished, some of the first people moved in during December of 1930 and started to get things set up. Apparently they got all new furniture for the 7 floors that were to house the bank. The idea of moving a bank HQ from one building to another in the 30s just screams for a rip-roaring story about a bank heist attempt. But not so fast, the Canadian Bank of Commerce is one step ahead. In an interview with the Toronto Daily Star on December 20th, the bank’s general manager said, “No one will ever know we have moved until it is all over. It obviously would not be the thing to broadcast the fact that we will be moving millions of dollars in cash, bullion, and securities at a given time and date.” Although…by even saying so in the paper, he kind of broadcast it anyway. If I were a heister, I’d just sit outside old headquarters every day and scope it out. Can’t move millions of dollars in cash, bullion, and securities in one go! Alas, and probably for the best, no one even attempted a heist. On the up and up!! The most compelling thing to me about this picture is the lack of traffic. When I say that this building was state of the art, I’m not even kidding. When it was all finished it was thirty six storeys, and it had some amazingly fancy modern features. It had a bunch of dining rooms for its staff that were equipped with kitchens whose “ceilings and walls are so treated that not the least sound of dish clattering can penetrate.” It had a memorial for staff members of the bank who had died in WWI (although they didn’t call it WWI in 1930. That would have been a bit…doom-and-gloom), and it had over forty fire-proof vault doors. It had a system of pneumatic tubes, fancy oak panelling in offices, a stone and marble cathedral-like chamber, and my personal favourite unnecessary feature: a barber shop in the basement. Now THAT is 1930s banking opulence. As a sidenote, pretty much the entire January 14th edition of The Globe was devoted to gushing about just how exquisite the whole thing was. They even talked about how amazing the refrigeration was, how the bank had “excellent service in [their] safety deposit system,” and they described the woodwork as “exceedingly pleasant.” Makes me picture Mr. Burns or something. This shot was taken in 1940. Courtesy of the Toronto Public Library. At the time it was completed, the Canadian Bank of Commerce building was the tallest in the commonwealth (which isn’t saying that much, but it’s still pretty cool). 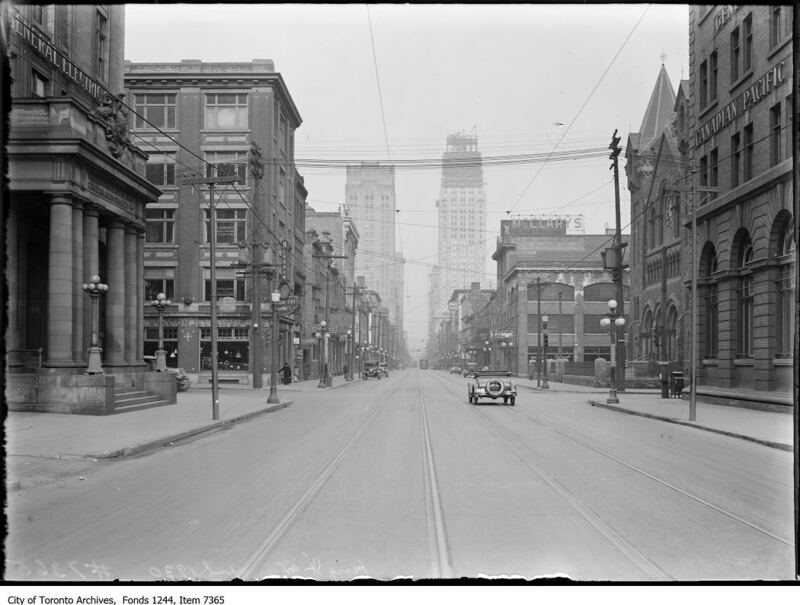 Of course, a few decades later the Canadian Bank of Commerce merged with the Imperial Bank of Canada to become CIBC, and now the Canadian Bank of Commerce building is called Commerce Court North, and is one of four buildings in the square. It actually held out as the tallest commonwealth buildiung until 1962, when a fellow CIBC building in Montreal topped it. In Toronto, it took until 1967 and the TD Bank tower to overtake it, and now it clocks in as the 51st tallest tower in Toronto (52nd if you count the CN Tower). Nevertheless, it was one of Toronto’s first legitimate skyscrapers, and is now the old grandfather tower, stately and classy, silently fuming at all the young rapscallion condos who are creating a ruckus on its front lawn.